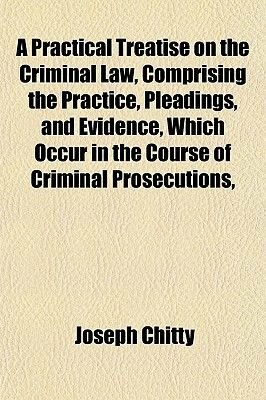 Title: A Practical Treatise on the Criminal Law, Comprising the Practice, Pleadings, and Evidence, Which Occur in the Course of Criminal Prosecutions, Whether by Indictment or Information, With a Copious Collection of Precedents of Indictments, Informations, Presentments, and Every Description of Practical Forms, With Comprehensive Notes Upon Each Offence, the Process, Indictment, Plea, Defence, Evidence, Trial, Verdict, Judgment, and Punishment Volume: 02 Publisher: London: Brooke Publication date: 1826 Subjects: Criminal procedure -- Great Britain Forms (Law) -- Great Britain Notes: This is an OCR reprint. There may be numerous typos or missing text. There are no illustrations or indexes. When you buy the General Books edition of this book you get free trial access to Million-Books.com where you can select from more than a million books for free. You can also preview the book there.